On June 1, 2017, the United States, currently helmed by Donald J. Trump, businessman extraordinaire, withdrew from the landmark Paris Climate Agreement. We are now aligned in this position with Syria and Nicaragua, while opposing countries like Russia, China, India, Afghanistan, Australia, the United Kingdom, France, Germany and about 140 others. This, even though the United States, with our big cars and big houses and huge appetites, is responsible for 14.3% of all greenhouse emissions worldwide, according to Wikipedia. This, while Albania, which is responsible for .02% of all greenhouse emissions, remains at the table, willing to discuss how they can do even better. Why would he make such a disastrous decision, even after all these US companies took out an ad in the Wall Street Journal asking him to keep the United States in the agreement? The only possible reason to withdraw is to keep a campaign promise, one likely offered in the moment to feed his base some anti-Obama red meat. Like the wall, it was probably never thought through. Like the wall, when he saw that it played well, he doubled down. But these days, with all the heat about Russia squarely on him and those closest to him, he can’t afford to lose any more support from his base. And his supporters, not all of them but many of them, have bought into the lie that climate change is not real. Or if it is, it’s not man-made. Or if it is, there’s nothing we mere humans can do. Or if there is, who cares, there’s so much money to be made, and so little time. Even less time now, I’m afraid. For many of these Americans, I suppose, if it gets too warm outside, they can just turn up the air conditioning. Does that sound condescending, or like liberal arrogance? I don’t intend that. I’m just afraid it’s true. Trump said in his address, “I was elected to represent the citizens of Pittsburgh, not Paris.” What he doesn’t seem to understand is that cities and countries are merely human-made divisions that have nothing to do with the effects of rising tides and melting ice caps across the entire globe. The sea won’t cease to rise over the shores of our coastal cities because Trump and his supporters have drawn a line around America. Mother Earth cries today, because we Americans, a once-powerful global influencer, have given the head seat at the table away. We will not lead on wind energy. We will not carve the way on solar energy. We will not break-through in geothermal energy. All of us alive today grew up under the idea of American leadership both moral and scientific. We grew up thinking we would always be the country taking risks, innovating, and raising generation after generation of researchers, thinkers, inventors, engineers—people willing to go first, stand out, and inspire the next generation. Emmanuel Macron, the new president of France, is now inviting these people to come and work with him instead of staying in America. In Paris, he promises, they will receive a budget to support and further their work. He closes the video by saying, “France is your nation.” While I am grateful there are many other countries who will be moving forward, I weep. It could’ve been us. 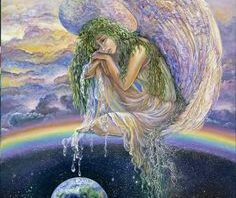 Mother Earth sobs today, because she has been trying to wake us up to her deteriorating condition for decades. She hoped that the graphs and charts we now have the ability to create would encourage us to change course. When that wasn’t enough, she thought a few wild shake-ups of the earth’s plates might do it, or the strengthening of her magnificent water cyclones. She thought that maybe a steady, measurable loss of our animal, plant, and insect species, now disappearing at a rate of about 200 per day, would widen our eyes. Mother Earth weeps, because she was mistaken about us. She thought that if she offered us a habitable world, we would in turn, care for her. Maybe she underestimated our greed. Maybe she didn’t understand bribes or transactional politics. I recently read an article in The New York Times suggesting that we humans are not cut out for living in the moment. As a spiritual practitioner and teacher who has often taught techniques for exactly this purpose, I read it. The argument was that trying to distinguish what makes human beings different from (never mind better than) animals, is not all that easy to do. We do not differ from them in the making of tools, or development of language, or even our ability to cooperate. The distinguishing feature, the authors argue, is that unlike animals, we don’t live in the moment. We humans, once out of toddler-hood, think ahead, and plan for a future that we believe will unfold. Animals, on the other hand, think only of Now. Even squirrels don’t tuck away food because they are considering a rainy day; it’s just instinct. Humans understand that the actions we take today will affect countless nameless and faceless people tomorrow. Those of us really plugged in to things like collective consciousness, or karma, or paying it forward, use extra caution when engaging in the world so as to influence the future in a positive way. The authors of the article argue that if we did not have this unique ability to see the connectedness of past, present and future, we would not be distinct from the animal kingdom at all. The article struck me as particularly timely, as we now have a president who truly does not consider the future. In fact, Trump’s recent decision to withdraw from the agreement was made with zero consideration or care of the future. It was made with mindless, reckless disregard for the nameless and faceless who would like to occupy this planet once we are all gone. Some of his aides call his leadership style “transactional.” His supporters call it deal-making. I call it operating from the lizard-brain—the part of all of us that operates solely in the moment, for the moment. The part of us that follows the philosophy “live another day,” not “live many more days.” The part of us that is most like those in the animal kingdom. I can’t help but wonder if animals are in some ways actually more evolved than we are. Because while we live and work in climate-controlled buildings, they walk or crawl upon the earth, attuned and responding to the earth and her cycles. Birds don’t need charts and graphs to know when to fly south. It was elephants who felt the tsunami in Thailand before any human did. Animals pay attention and adjust—accordingly, instinctively, immediately. They know that if they fail to listen to the signs, they will die off. Apparently, the US no longer accepts this basic mammalian truth. There are some signs of hope emerging. I’ve already seen reports that cities and companies plan to adhere to the Paris accord targets, despite our national withdrawal. But it will never be the same when we don’t have a seat at the global table. So do millions of creatures across the globe. This entry was posted in Activism, climate, current events, earth. Bookmark the permalink.